Your support makes our community impact possible! Now through December 31, your support goes twice as far. Every new and increased donation will be matched by Board Chair, Joann Leatherby, and her husband, Greg Bates, longtime Pacific Symphony donors. Pacific Symphony offers programs that provide students of all ages the opportunity to experience the benefits of music education. 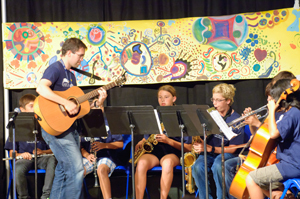 For instance, each summer, teachers throughout Orange County nominate 7th and 8th grade students to attend the arts-X-press summer immersion camp, which encourages students to take creative risks, grow as individuals and discover ways in which the arts can enrich their lives. Every year, Pacific Symphony presents spectacular events that celebrate the rich and diverse cultures that exist in Orange County. 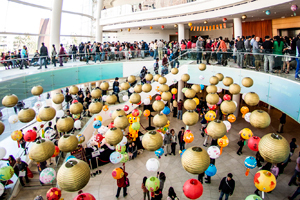 The 2018-19 Season’s special events include: festivities honoring the Lunar New Year and the Year of the Pig; the fourth annual Lantern Festival; a special concert for Nowruz, the Persian New Year; and a presentation of Defiant Requiem, which tells the story of the courageous Jewish prisoners in the Terezín Concentration Camp during World War II. Heartstrings is an example of one of Pacific Symphony’s major community-wide programs providing free access to concerts, hands-on enrichment activities and transportation for a range of underserved local residents in partnership with Orange County agencies. 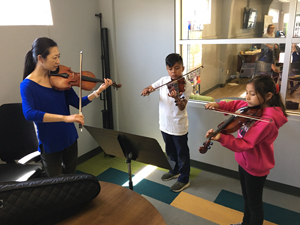 Music education programs such as Santa Ana Strings have proven to facilitate student acquisition of key life skills including literacy, problem solving, teamwork, self-discipline, perseverance, self-esteem and an ability to set and achieve high goals for themselves. As the end of the year draws near, and individuals prepare for the season of thanksgiving and end-of-year giving, Pacific Symphony acknowledges everyone who donates their resources, time, and talent to safeguard the success of all its artistic and education programs. Pacific Symphony also appeals to the generosity of new individuals and organizations to help enrich the lives of our community members through the power of music. Every year, over 50,000 community members are served through artistic, education and engagement programs. Click here to learn more about the ways in which Pacific Symphony ensures that everyone in our community has access to high-quality artistic and education programming regardless of age, background, socio-economic condition or other challenging circumstance. 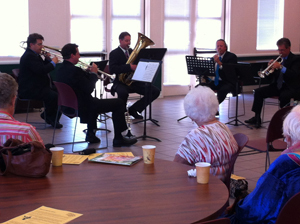 Learn about other Pacific Symphony community engagement programs. SUPPORT Pacific Symphony’s outstanding artistic and education programs today.